Is It Good? 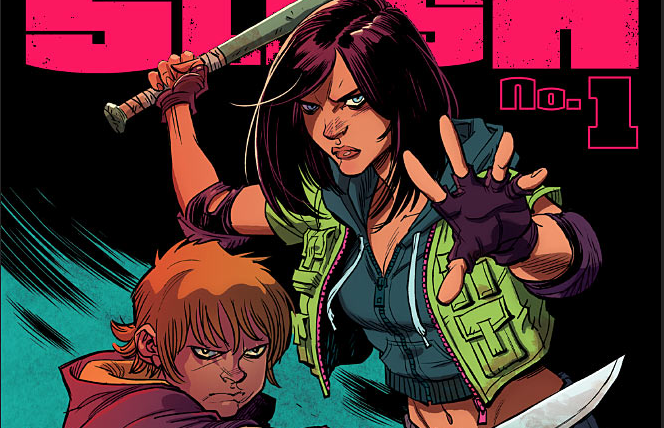 Hack Slash Son Of Samhain #1 Review – AiPT! A scantily-clad monster hunter might seem like standard fare comic book content these days — but not when you throw some mythology into the mix! Hack/Slash: Son of Samhain: is it good? I’ll be honest: I haven’t read many Hack/Slash issues in my life. The general idea is easy to grasp though; a girl named Cassie Hack was attacked by a slasher who happened to be her mom. Cassie devoted her life to taking out these slashers and ultimately, real monsters. Enter this issue where we learn monsters once ruled the Earth. They were put in their place by us pesky humans and now the god of monsters is trapped very deep in the Earth. After a run-in with a slasher, Cassie runs into a Crocodile Dundee-looking monster hunter, who brings her in on the big game that is the monster god. Rope vs monster. Rope wins. The script, written by Michael Moreci and Steve Seeley is a great set up to what could be a truly epic storyline. Hack is introduced in a quick, yet effective way, albeit there is a lot of dialogue between her and her new hunter friend to set her up. At the same time the set up as to what’s at stake and the imminent threat is good. Once we do get underground you can tell Hack and her new friend are going to have an interesting dynamic. One is a grizzled old man who thinks he knows everything, the other Hack, who’s done this so much she enjoys the kill more than anybody. This issue doesn’t deliver completely on much of what it promises, but that’s because there’s so much being put on the table to chew on. Personally I enjoy any story that goes the mythic route so when there are flashbacks to an older time (as far back as caveman times it appears) and monsters ruled the Earth? Now that’s cool. Considering how Hack is a vigilante being thrust into this situation one can imagine the hero’s journey will be better for it. How can humans take on these things? The art by Emilio Laiso is pretty spot on when it comes to layouts and action. The monsters are effectively gross and, well, monstrous, and Hack isn’t drawn in a derogatory way. Yeah, she is usually scantily clad, but that’s sort of her character, and there’s nothing gratuitous in this book. That helps support her hero persona over the slutty persona most female characters get in comics these days. I was pleasantly surprised by this first issue that effectively sets up a truly epic monster hunt for our girl Hack. Here’s to hoping things continue to develop in a compelling way.